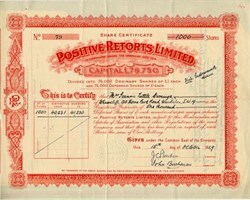 Beautiful certificate from Positive Retorts, Limited issued on October 18, 1929 (11 days before the stock market crash). This historic document was printed by Walter Mair Company and has an ornate border around it. This item has the signatures of the Company's Directors and is over 77 years old.